Biomass Gasification – Power Plants | AIR TECHNIC s.r.o. AIR TECHNIC s.r.o. designs and builds complete biomass gasification power plants with IC engines and generators. In the year 2015 AIR TECHNIC s.r.o. successfully completed gasification technology development. Plant and technology’s technical parameters and commercial reliability are proven in continuous operation. 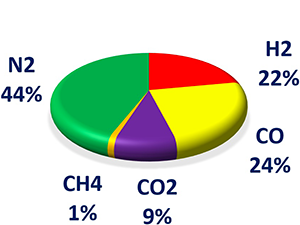 Gasification is a termochemical conversion of carbonaceous materials (biomass) into combustible gases. This is achieved by reacting the material at high temperatures with a controlled amount of air or mixture of oxygen with steam, depending on the use of the generator gas. The main product of gasification is a generator gas (syngas) containing the gaseous components of H2, CO, CO2, CH4, H2O, N2, hydrocarbons and higher boiling pyrolysis products (tar) and a solid residue often containing a certain amount of carbon, dust and other compounds. The gasifier developed by AIR TECHNIC is atmospheric, unique downdraft configuration. The gasification of the biomass is divided into zones in the gasifier – drying, pyrolysis, oxidation and reduction. The main advantage of this type gasifier is the production of syngas with low tar content for IC engines. Higher electrical and thermal output is achieved by parallel arrangement of gasifier lines, i.e. syngas generators and IC engines. Wood chip and biomass gasification technology for syngas generation. Generated syngas is cooled and filtered prior to being fired in IC engines. Syngas generation byproduct is Biochar, which has commercial use. Cleaned and cooled syngas is used for electricity generation in IC engines coupled to electricity generators. 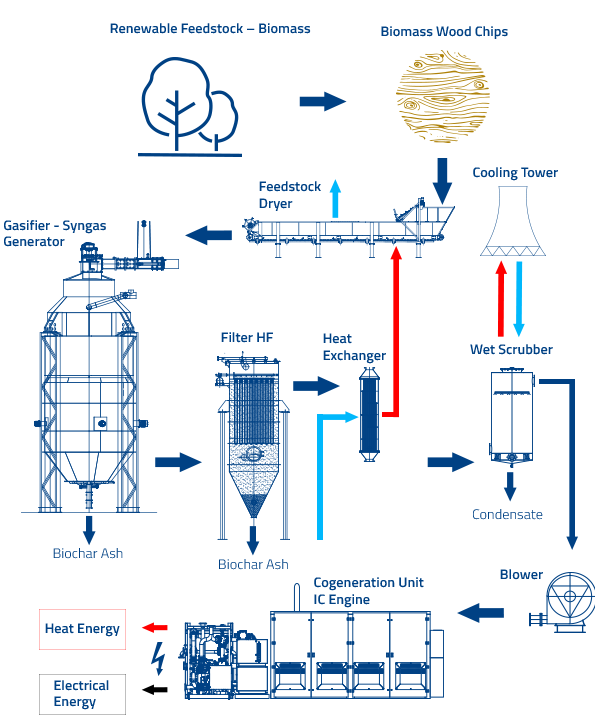 Waste heat from IC engines cooling systems is extracted and used for feedstock drying and commercial use. Existing plants are equipped with IC engines manufactured by either ELTECO (GUASCOR – Dresser Rand) or GE Jenbacher. Feedstock is dried in wood chips dryer. Further processing includes screening for fines, overs, tramp metals removal system and conveyors. I&C systems and monitoring allow local and remote control of individual systems and/or complete plant. 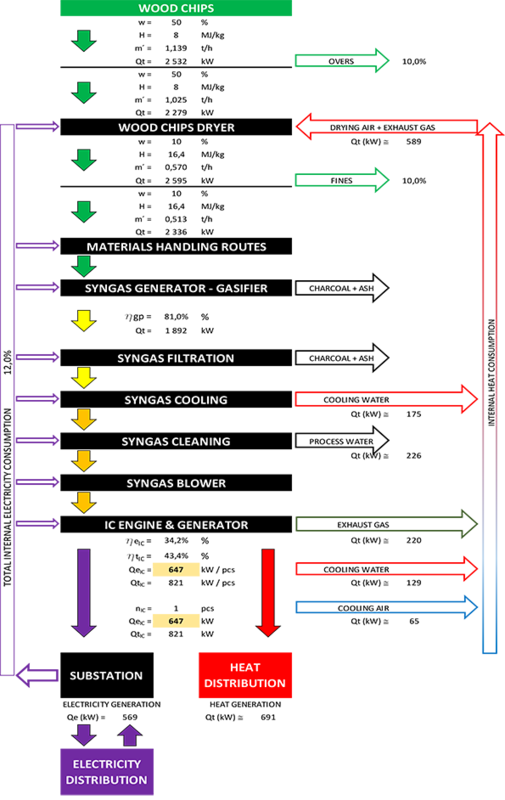 Heating and cooling systems service IC engine, syngas and other components cooling. Waste heat is further utilized for feedstock drying and commercial use. Ventilation system controls and distributes air for feedstock drying. Ventilation is also used for cooling of the machinery room and switchboards. Nitrogen generation and distribution system is used for syngas HF filter regeneration and pneumatic actuators. Auxiliary fuel system is used for gasifier start-up, gasifier flare stabilization and syngas generator warm up. Gasification equipment supporting steel structures are independent of building’s structures.